THE GLORIOUS SUNSHINE that we’ve been enjoying in Paris over the last few weeks completely deserted us last Sunday. Successive days of temperatures in the high 30s gave way to a leaden grey sky and heavy rain. 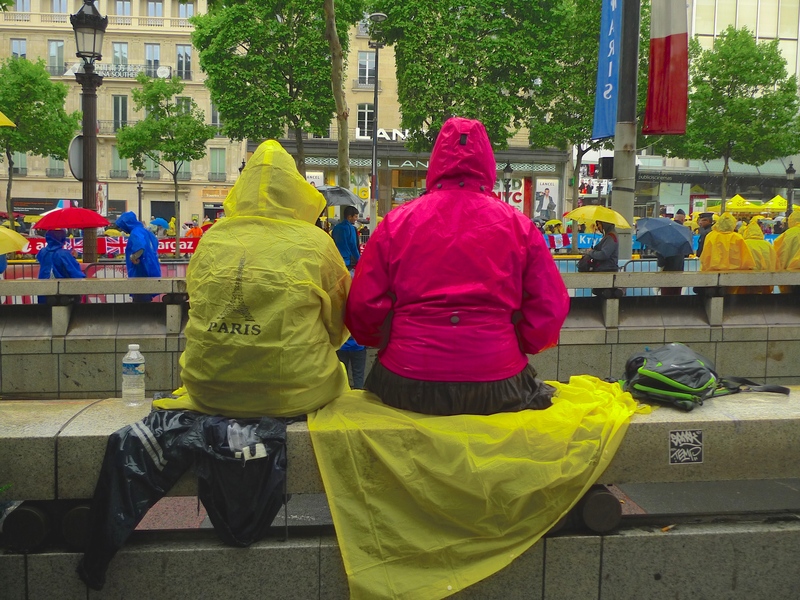 But the change in the weather did little to dampen the enthusiasm of the crowds gathered in the Champs Élysées to watch the final stage of this year’s 102nd edition of the Tour de France. Starting in Utrecht in the Netherlands on Saturday 4th July, this year’s Grande Boucle was made up of 21 stages covering a total distance of 3,360 kilometres. After two stages in the Netherlands, the Tour crossed Belgium and northern France before moving south for the gruelling mountain stages in the Pyrenees and the Alps. 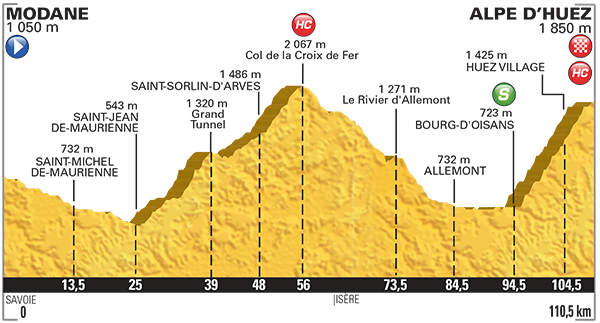 The stage profiles this year included nine flat stages, three hill stages, seven mountain stages with five altitude finishes, one individual time-trial stage, one team time-trial stage and two much needed rest days. After the penultimate gruelling stage from Saint-Jean-de-Maurienne to La Toussuire – Les Sybelles in the Alps, including an ascent up the tortuous Col de la Croix de Fer and the Alpe d’Huez, this year’s final stage of the Tour was much more leisurely. It is customary that the result of the Tour de France is settled at the end of the penultimate stage so, barring something completely unexpected happening, the final stage is largely a procession for the victor. Of course, there are still points to be scored and prize money to be won so the final sprint finish in the Champs Élysées is always exciting. 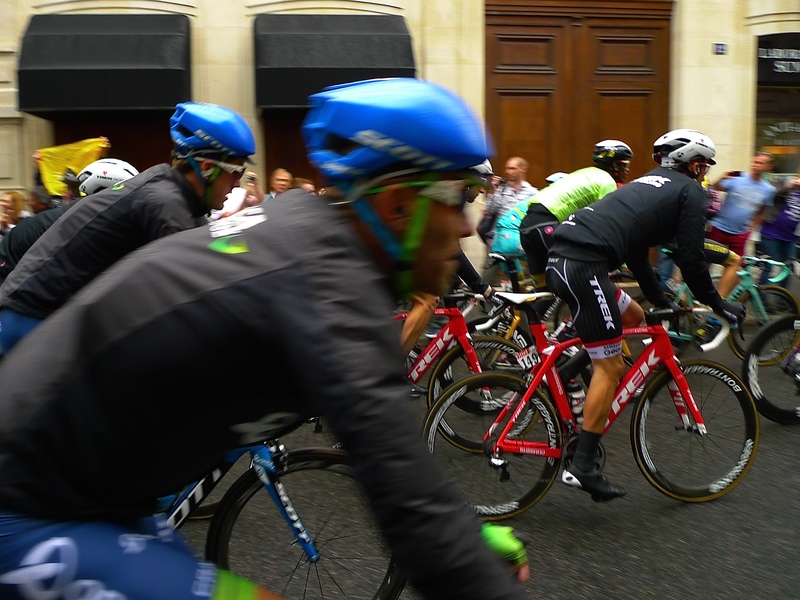 This year’s final stage, a mere 109.5 km from Sèvres – Grand Paris Seine Ouest to the Champs-Élysées in Paris, saw the Tour pass very close to my home. Entering the outskirts of Paris, the 160 riders crossed the Bois de Boulogne, rounded Porte Maillot and headed up the Avenue de la Grande Armée before turning right into rue de Presbourg. From here their route took them to the Trocadéro, the Tour Eiffel, Les Invalides, the Assemblé Nationale, the Louvre and then into rue de Rivoli and ten laps of the Champs Élysées. An hour and a half before the riders were due to appear I took up position in rue de Presbourg, a narrow street leading to the Trocédero. Armed with my microphones and camera I was preparing to capture the riders passing so close to me that I could reach out and touch them. As I waited a procession of team buses passed me, each a temporary refuge for the riders before and after each race stage. Then, right on cue, three motorcycles from the gendarmerie hove into view heralding the approach of the convoy of official cars, press photographers and TV cameramen on motorcycles, the medical cars, the ambulances and the team cars surrounding the peloton, all 160 riders tightly bunched together. As you can hear, it took seven minutes for the convoy of attendant vehicles to pass but, as is the way with the Tour, you wait for hours and then the riders pass in the blink of an eye. So, with the riders and their entourage safely on their way I made off for the Champs Élysées to record them negotiating ten laps of la plus belle avenue du monde before a dramatic sprint finish. André Greipel won the final stage, his fourth stage of this year’s Tour de France despite Bryan Coquard’s final rush. Chris Froome was declared the overall winner of the 102nd Tour de France and also King of the Mountains, making him the only British rider to have won the Tour twice and the first rider since Eddy Merckx in 1970 to claim the yellow and polka-dot jerseys in the same Tour. The other podium finishers were Nairo Quintana who came second and his Movistar team mate, Alejandro Valverde, was in third place. Last year’s winner, Vincenzo Nibali, was in fourth place and the two-time Tour winner, Alberto Contador, was in fifth place. Peter Sagan won the points competition for the fourth straight time, Nairo Quintana was the best young rider, Romain Bardet was declared the the most aggressive rider of the whole race and the Movistar team won the team classification. And spare a thought for Sébastian Chavanel, the Lanterne Rouge, the last man in the general classification, who finished with a time 4 hours 56 minutes and 59 seconds behind the winner. This year’s Tour de France has been as exciting as ever and not without controversy but Chris Froome claimed the maillot jaune, the yellow jersey, after Stage 7 and with brilliant support from his team mates in Team Sky, and despite several serious challenges from Nairo Quintana, Alejandro Valverde and Vincenzo Nibali in the mountains, he successfully defended it to the end. Bravo to Chris Froome and Team Sky for not only winning this year’s Tour but also for showing such resilience in the face of some remarkably inept journalism. And thanks too to all the other riders, including those who didn’t make to the end, all of whom showed enormous courage, determination and panache in the face of what seems to most of us to be an impossible challenge. 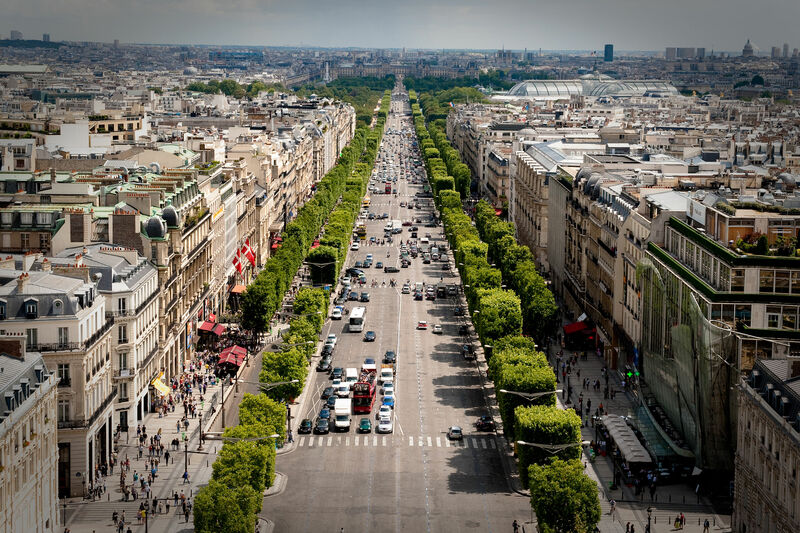 IN JULY EACH YEAR, the Champs Elysées hosts two major events, the défilé, the large parade on 14th July, the centrepiece of La Fête National, and in the last week of the month, the final stage of the Tour de France. Both events occupy the whole of the Champs Elysées from the Arc de Triomphe to Place de la Concorde and both attract large crowds. But while the former is of largely national interest, the latter commands a global audience. 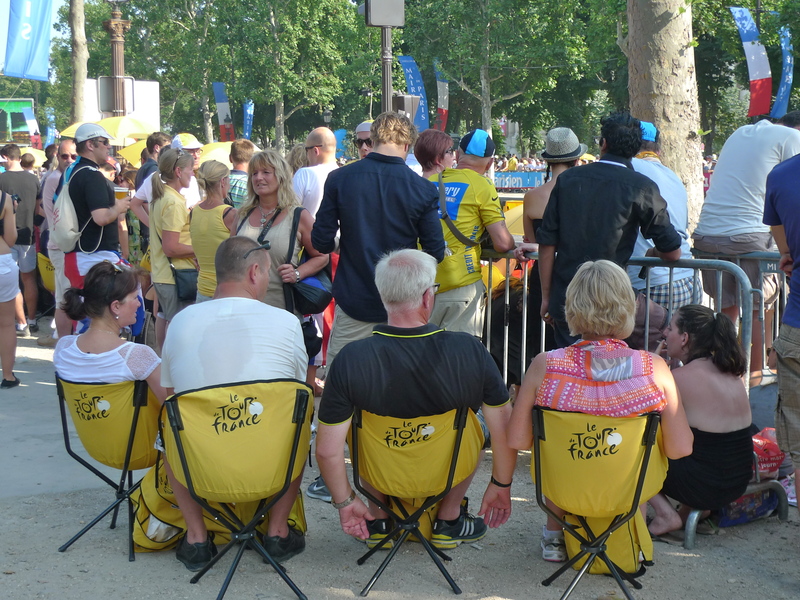 The Tour de France is the world’s largest annual sporting event and it’s the greatest free show on earth. Only the Olympic Games and the FIFA football World Cup, which take place every four years, attract a bigger audience. 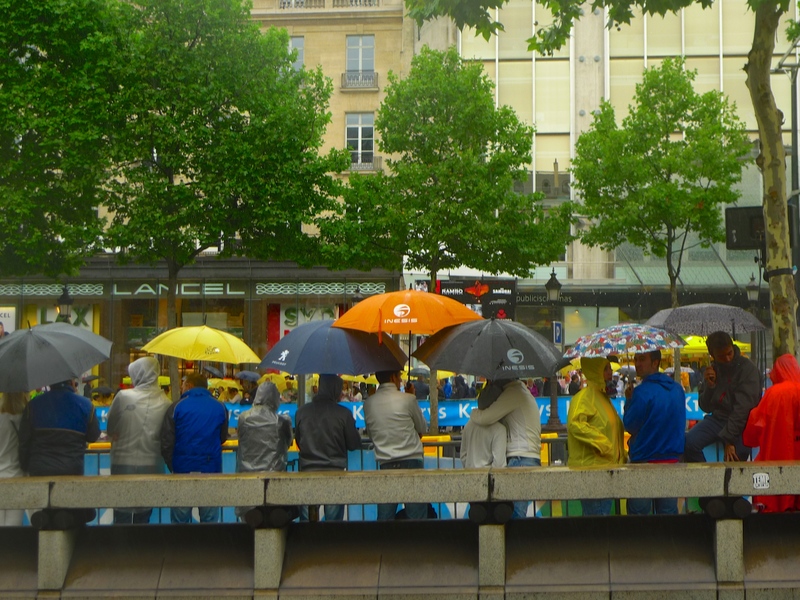 Each year some 12 million spectators watch le Tour along the route each spending on average six hours at a time at the roadside. But that number is tiny compared to the television audience. This year, 121 different television channels across the world broadcast the race in 188 countries to a worldwide television audience of 3.5 billion people. 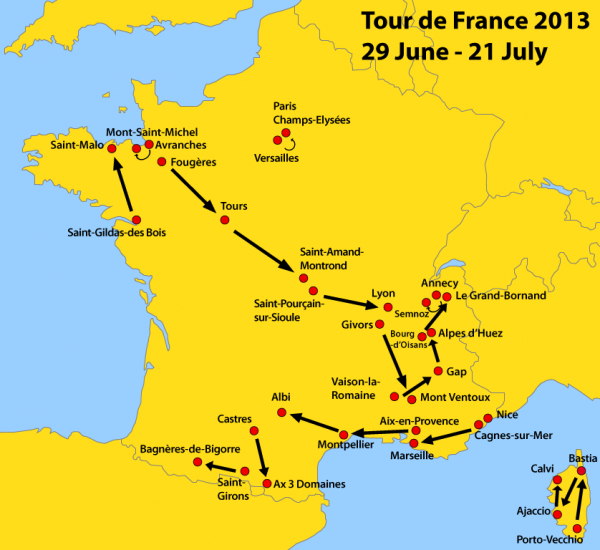 Running for three weeks from Saturday 5th July to Sunday 27th July, this year’s Tour de France, the 101st, comprised 21 stages covering a total distance of 3,664 kilometres. There were nine flat stages, five hill stages, six mountain stages with five altitude finishes, one individual time trial stage and two rest days. 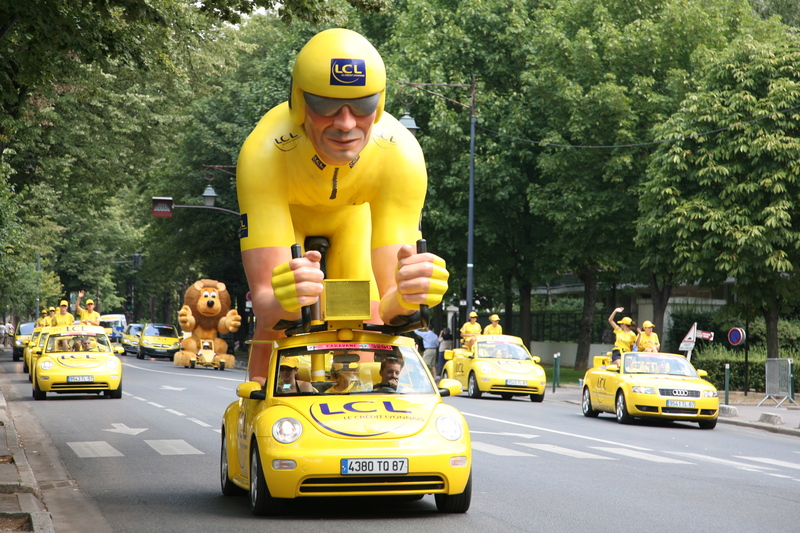 I follow le Tour every year but for a long-time ex-pat like me, this year’s Tour was extra special. The Grand Départ, the first stage of le Tour, is always a showpiece often taking place in countries outside France. This year, the first three stages took place in the UK, but more that that, the first two stages took place in Yorkshire, a place where I lived for twenty years and a place I know very well. With Day 1 of le Tour stretching some 190 km from Leeds to Harrogate and Day 2, 201km from York to Sheffield, the local wits quickly dubbed this year’s Tour as le Tour de Yorkshire! After leaving the UK, le Tour travelled to France and, with a detour into Belgium, paid it’s respects to the centenary of the outbreak of the First World War by racing through Ypres, Arras and the haunting plateau of the Chemin des Dames. 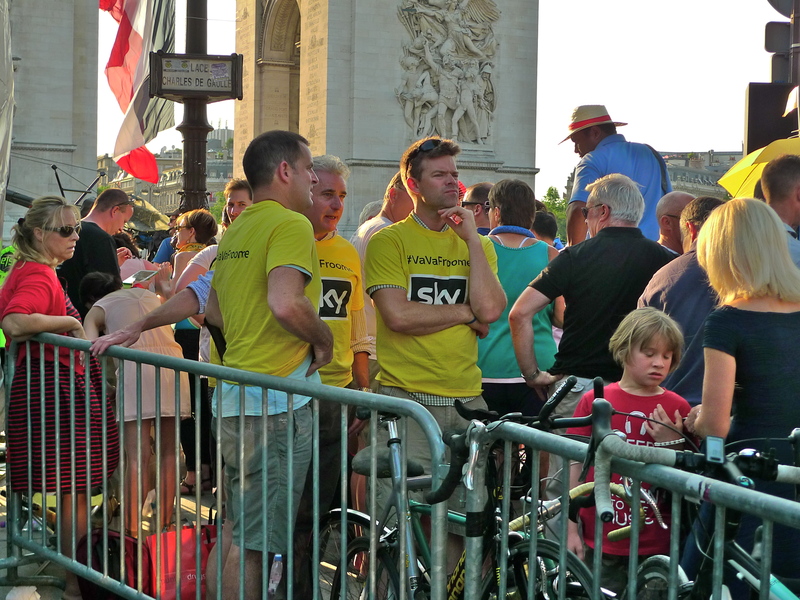 I didn’t go to the start of le Tour in Yorkshire but I did go to the finish in the Champs Elysées on Sunday. 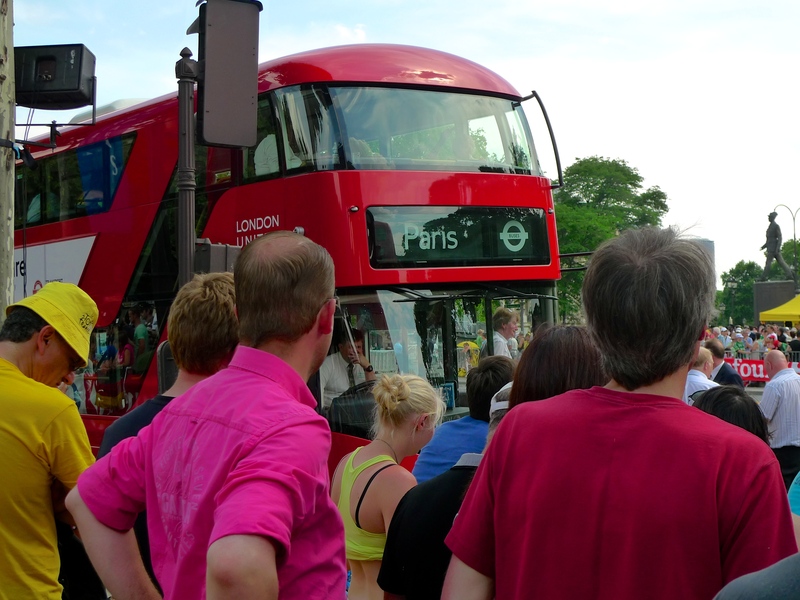 And there I found that the UK theme continued in the shape of a couple of London buses. 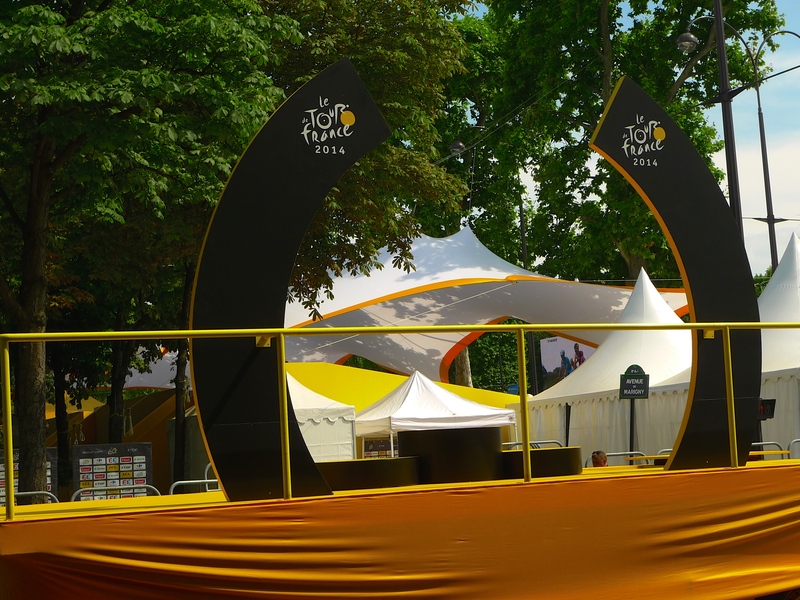 Since 1975, the final stage of le Tour de France has ended in the Champs Elysées and the format is the same as with all the other stages of le Tour. 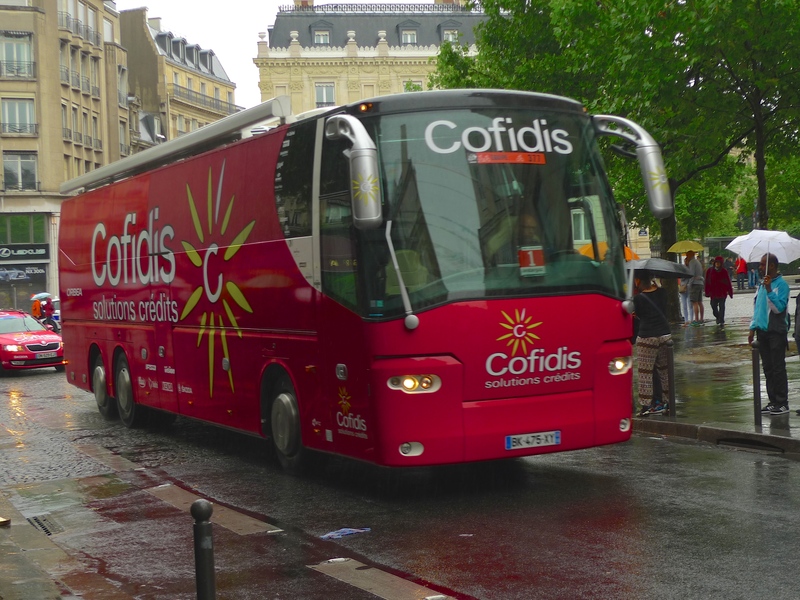 First comes the caravane publicitaire, the colourful and noisy procession of sponsor’s vehicles. The numbers vary from year to year but there are usually around 250 vehicles in the procession, they arrive 90 minutes before the race riders and it takes them 40 minutes to pass. Then comes the race itself. 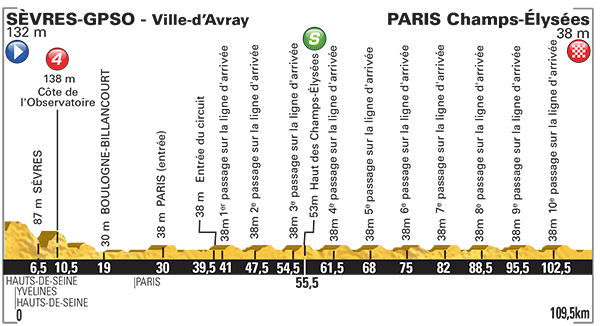 This year the final stage began at Évry just to the south of Paris and it finished with eight laps around the Champs Elysées. 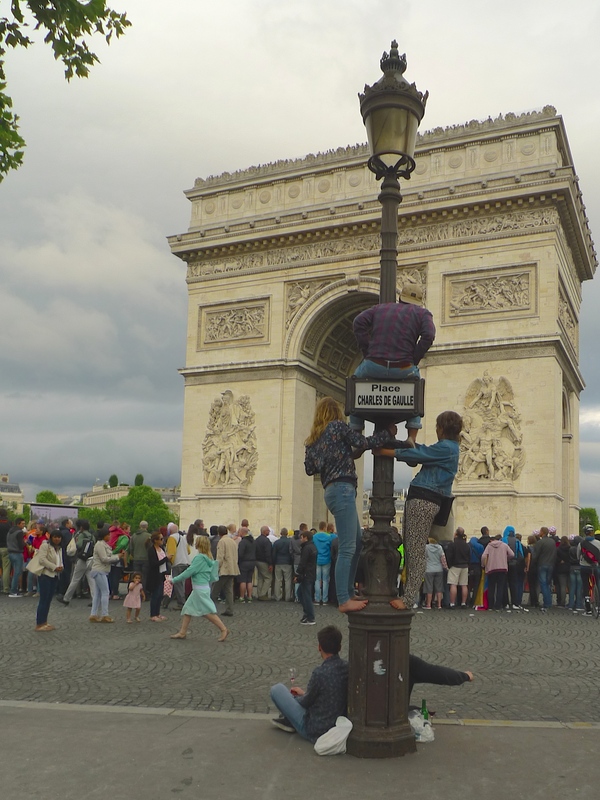 Copying last year’s 100th edition of le Tour, the route up and down the Champs Elysées was extended to include a circuit around the Arc de Triomphe and a fly-past by the Patrouille de France as the riders arrived. After the vibrancy of the caravane publicitaire and the excitement of the finish of the race comes the ceremonie protocolaire, the awards ceremony. 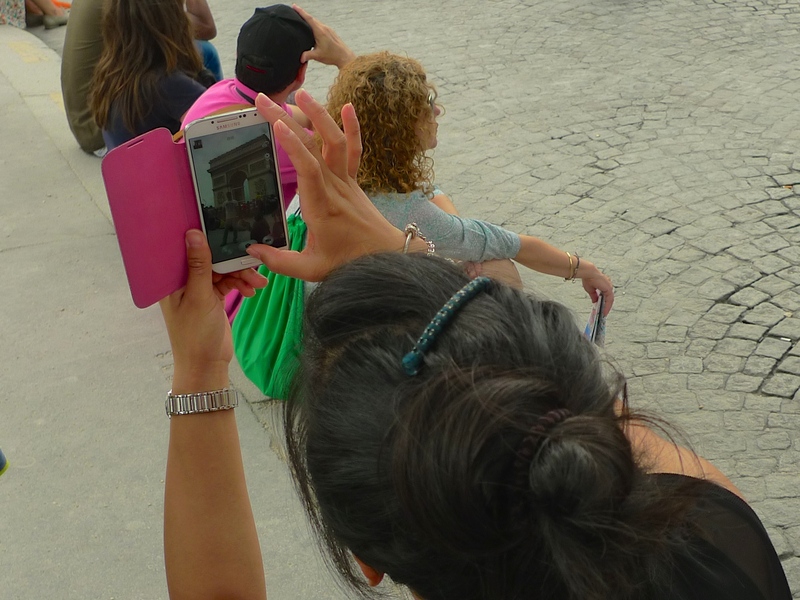 I record the end of le Tour every year in the Champs Elysées so I’m very familiar with the routine. My first task is always to walk up and down the avenue looking for a vantage point from which to record. This is not always as easy as it sounds. I usually record the sounds of the caravane publicitaire from just beyond the finish line but because the public address system is so awful finding a spot from which to record the commentary is much more difficult. 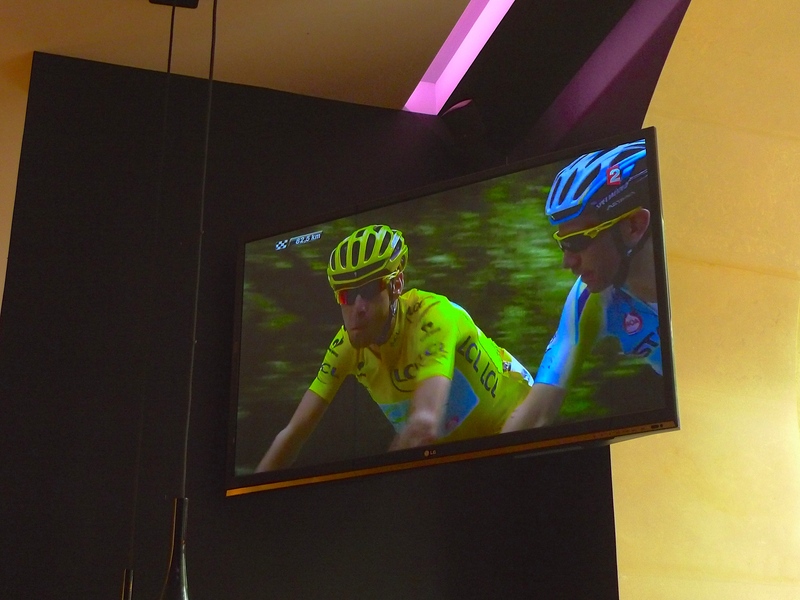 It often takes quite a long time to find just the right place but once I’ve found it I usually head off to a café I know just off the Champs Elysées where I’m guaranteed a seat, a cool glass of beer and a TV to watch the riders’ progress. As soon as I see the riders arrive in Paris I head back to my recording pitch and take up position. To actually see any of the race it’s necessary to get there early, occupy a vacant place and then spend several hours waiting for something to happen. The enthusiasts get themselves very well organised. 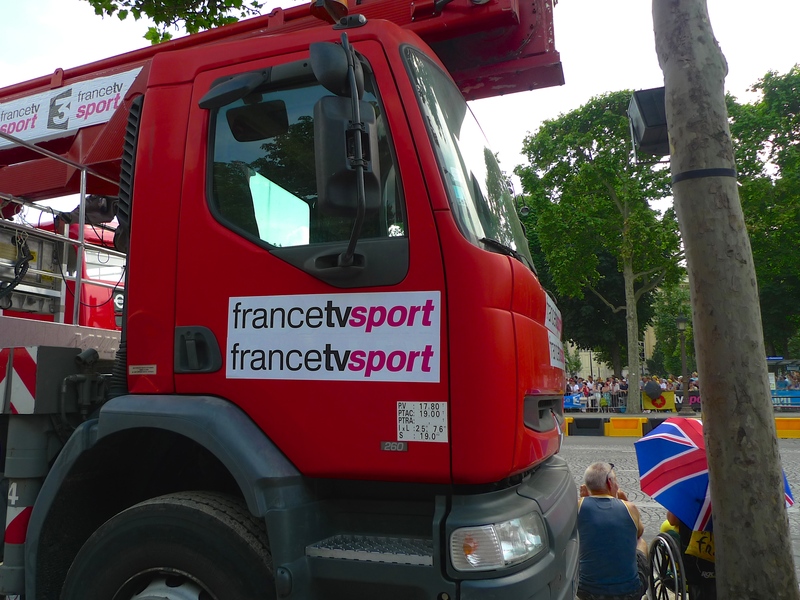 France Télévisions always have by far the best view with their outside broadcast cameras hoisted on cherry pickers stretching across the road and more cameras in the helicopters flying overhead. Their pictures are shared on the big-screen televisions situated at various points around the course. 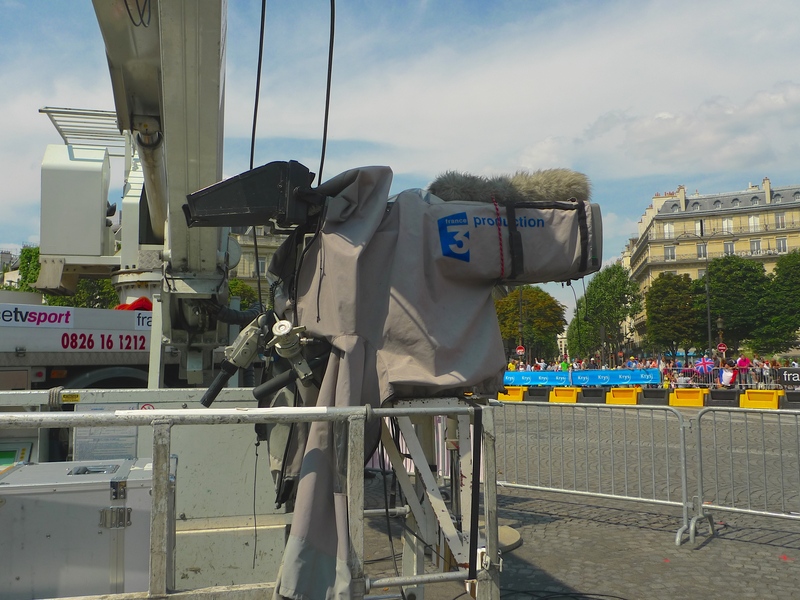 On Sunday I spent just over six hours at work in the Champs Elysées, waiting for and then recording the caravane publicitaire, searching out a site from which to record the commentary and recording the race and the ceremonie protocolaire. Altogether, I recorded just over three hours of sound a good part of which has now been consigned to my Paris Soundscapes Archive. 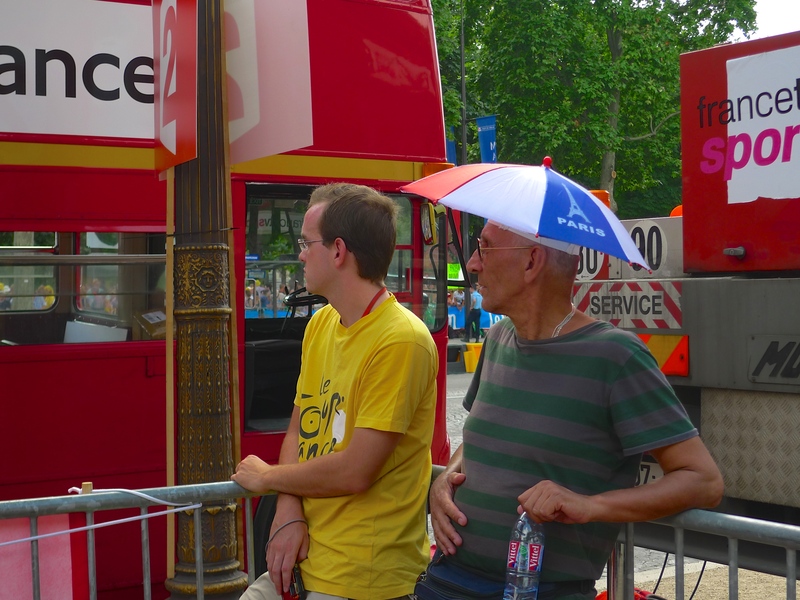 For those of you who haven’t got three hours to spare, here is a flavour of the end of le Tour de France 2014. 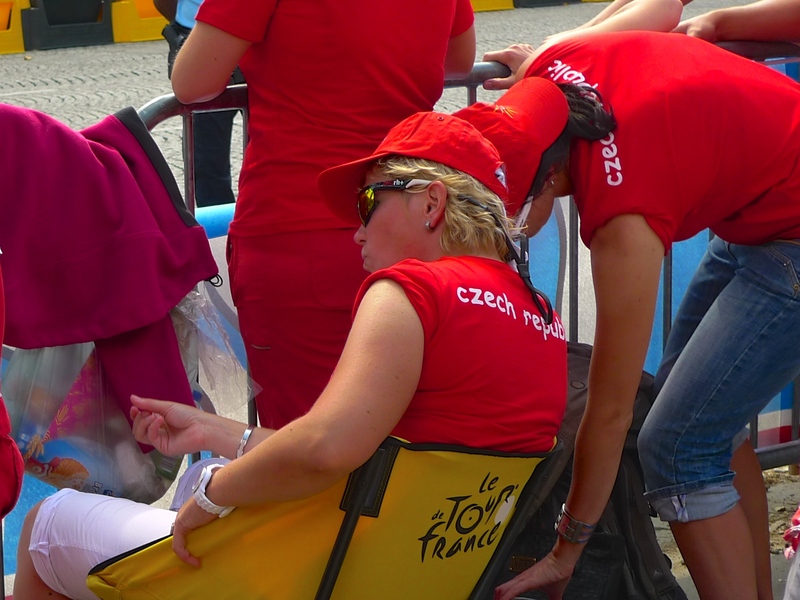 And what about the commentator and that distinctive voice, the voice of the Tour de France? For those of you who may have wondered, his name is Daniel Mangeas and he’s been the commentator of the Tour de France, and other cycle races, since 1974. He commentates on some 200 events a year. For le Tour he spends two hours at the microphone presenting the riders at the start of each day’s race and then he drives to the finish to commentate on the last 50km of the race. He was, of course, in Yorkshire for this year’s Grand Départ and this being le Tour de France, he commentated in French. I can’t help wondering what all those Yorkshire Tykes made of that! On 5th July, 219 riders set off on the Grand Départ from Yorkshire in the United Kingdom. After three weeks, 3,664 kilometres and for the winner at least 89 hours 59 minutes and 6 seconds on the bike, 164 riders arrived at the finish line in the Champs Elysées on Sunday. Some riders didn’t make it to the finish, Mark Cavendish, Alberto Contador and Chris Froome being perhaps the most notable to crash out en route. The Italian, Vincenzo Nibali won the Tour de France 2014, a race he led for eighteen days out of twenty-one. This year also saw a return of French riders to the podium with Jean-Christophe Péraud and Thibaut Pinot finishing second and third respectively. The last stage on the Champs-Elysées went to Marcel Kittel just like last year. The German outsprinted Alexander Kristoff in a spectacular final sprint on the Champs-Elysées. Peter Sagan won the Green Jersey for the best sprinter, Rafal Majka won the Polka-Dot jersey for the best climber, Thibaut Pinot won the white jersey for the best young rider and Alessandro De Marchi won the prix de la combativité. AG2R La Mondiale won the team prize. And spare a thought for the man who finished last, the lanterne rouge, Ji Cheng, the first Chinese rider to compete in the Tour de France. The fact that he came last, just over 6 hours on aggregate time behind the winner, doesn’t mean that he was the worst rider in the race. Like many riders, Ji Cheng is a domestique, whose job is to sacrifice his own position in the race to protect his team leader, to supply him with food and drink during each stage and to chase down riders who break away from the peloton. Ji Cheng won the affection of the crowds because he did his job so well. IT’S LATE JULY and the Champs Elysées, la plus belle avenue du monde, has only just recovered from staging La Fête Nationale and now La Grande Boucle is in town – the climax of the Tour de France 2013. 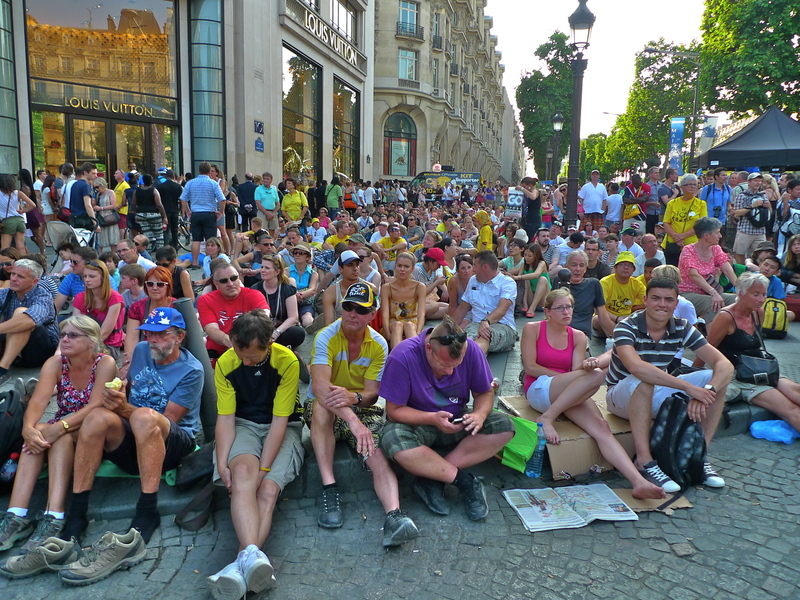 2013 marks the 100th edition of the Tour de France and the last stage in the Champs Elysées on Sunday was very special. 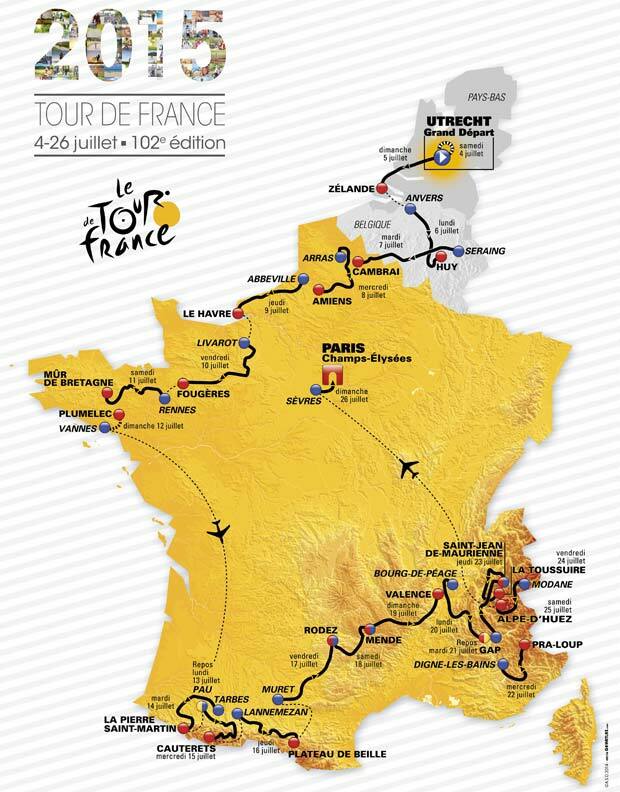 This 100th edition of Le Tour began in Corsica on 29th June. This was the Tour’s first ever visit to Corsica and 198 riders representing 22 teams set off from Porto-Vecchio to complete the first three stages on the island. 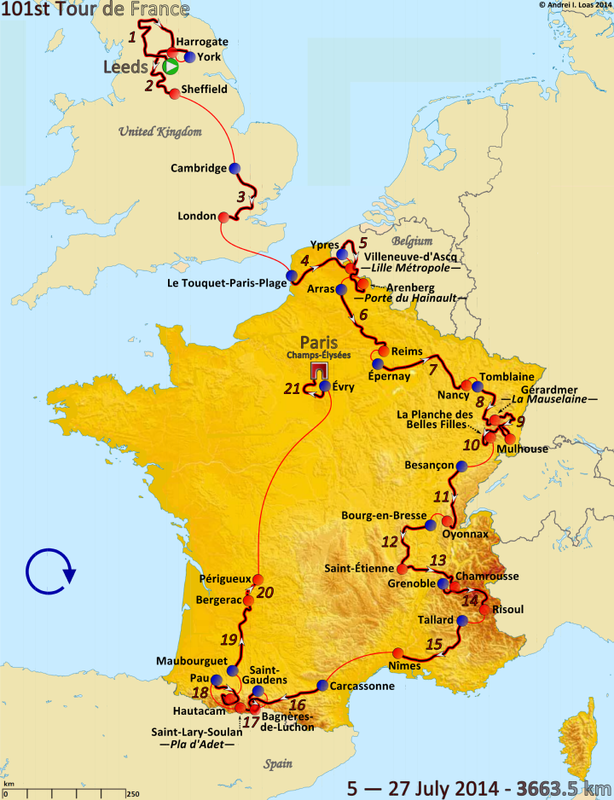 For the next three weeks, from 29th June to 21st July, le Tour criss-crossed France covering some 3,404 kilometres (2,115 miles). It visited 37 French departments and crossed 537 French municipalities. The 21 stages of this year’s Tour included eight flat stages, three hilly stages, seven mountain stages (with four summit finishes), two individual time trial stages and one team time trial stage. 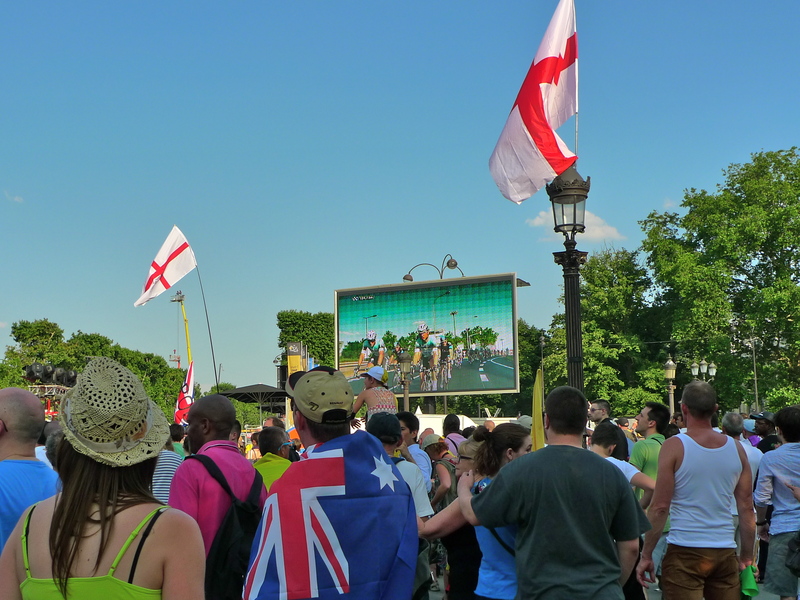 Le Tour was followed by some 2,000 journalists and was broadcast to 190 countries on 50 radio stations and 100 TV channels, 60 of them broadcasting live to 3.5 billion viewers worldwide. The estimate is that some 12 million people watched the Tour from the roadside along the route. 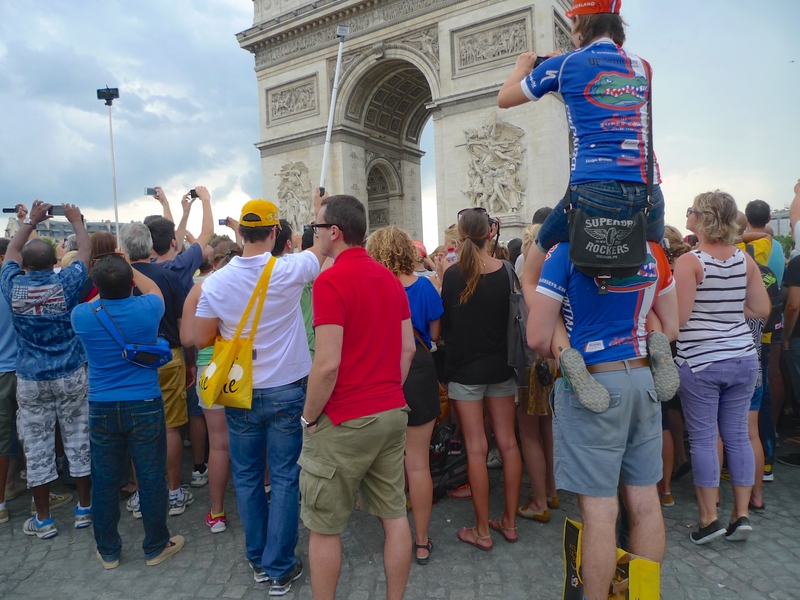 Each year the final stage of the Tour de France ends in the Champs Elysées in Paris and I’ve watched every one of these finishes since 1999 – but this year’s final stage was a little different. Instead of racing the final stage during the afternoon of the final day as is usual, this year, to mark the 100th edition of le Tour, the final stage began in the early evening at the magnificent Palace of Versailles. 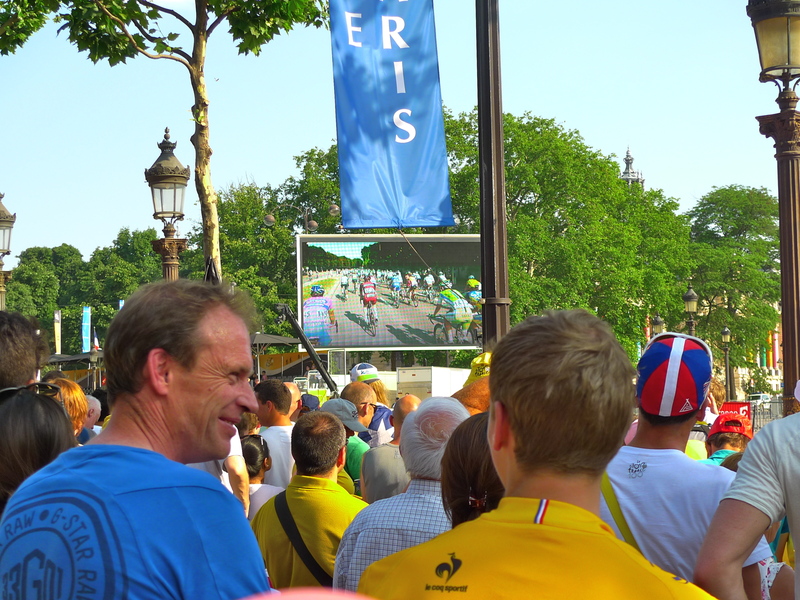 It then wound its way through the Parisian suburbs to arrive at the Champs Elysées as dusk was falling and, of course, I was there to watch and to record the events. I arrived in the Champs Elysées at the same time as the publicity caravan, the 12 kilometre procession comprising 180 sponsor’s vehicles manned by 600 people advertising 37 brands. This caravan processes along the route of every stage of the Tour and by the end of it they will have handed out some 14.5 million gifts to the watching public. 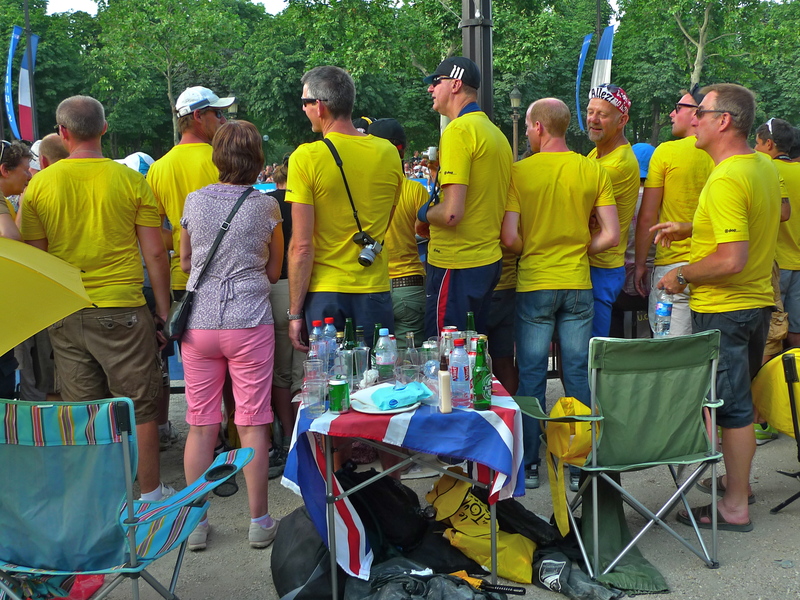 It took the caravan about 35 minutes to negotiate the Champs Elysées and it was all very colourful and very loud. 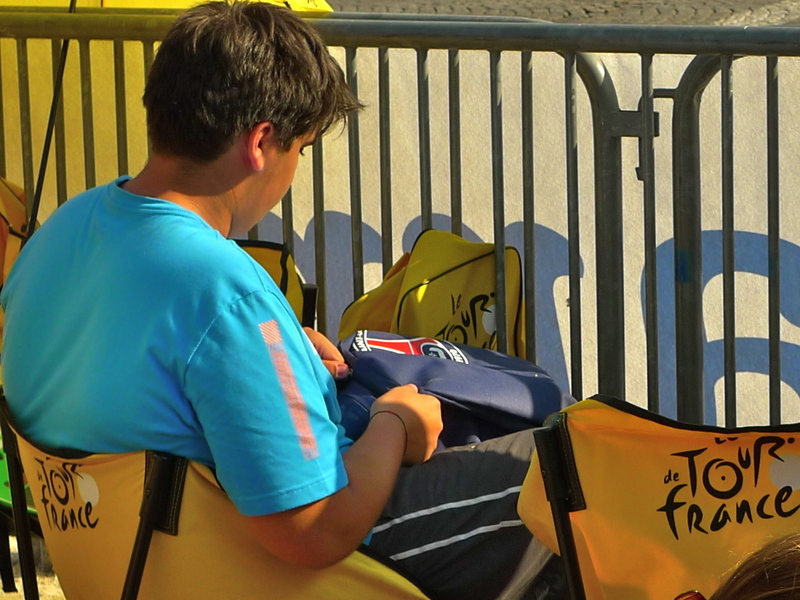 After 35 minutes of lively show time the wait for the main show of the day began. Some people had bagged their ideal viewing spot by the side of the road early, very early in some cases. Others had positioned themselves with a good view of one of the many big screen televisions that line the street so as to get the best view of the action. For me, it was all about getting into the right position to record the best sound even if I had to sacrifice the best view to do it. In another change to the final stage this year, the riders rode 10 times around the Champs Elysées instead of the usual 8 times and that included riding around the Arc de Triomphe, something they don’t usually do. 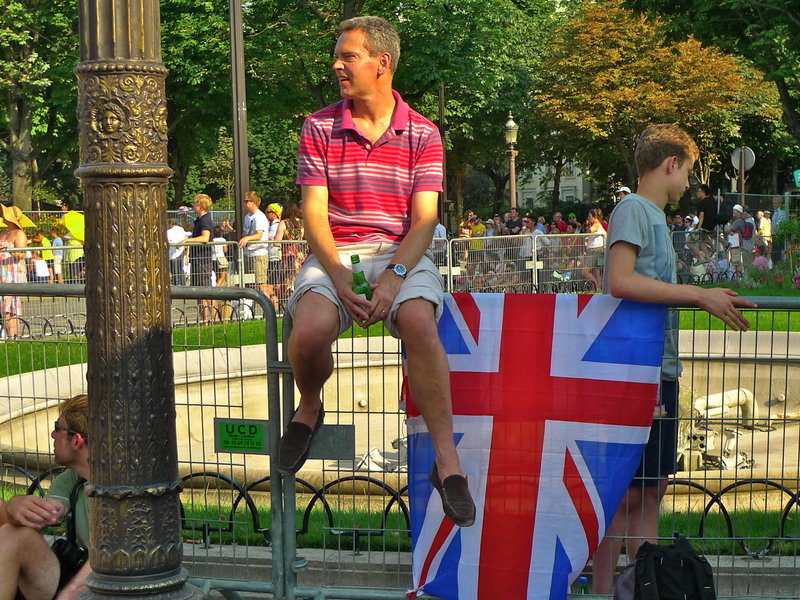 I decided to position myself at the top of the Champs Elysées close to the Arc de Triomphe behind a conclave of Brits, all enthusiastic Chris Froome supporters. This proved to be fortuitous. We had been promised something spectacular for this final stage of the 100th edition of the Tour de France but I hadn’t expected the dramatic sight and sound of La Patrouille de France flying overhead trailing red, white and blue smoke as the riders began their first lap of the Champs Elysées. 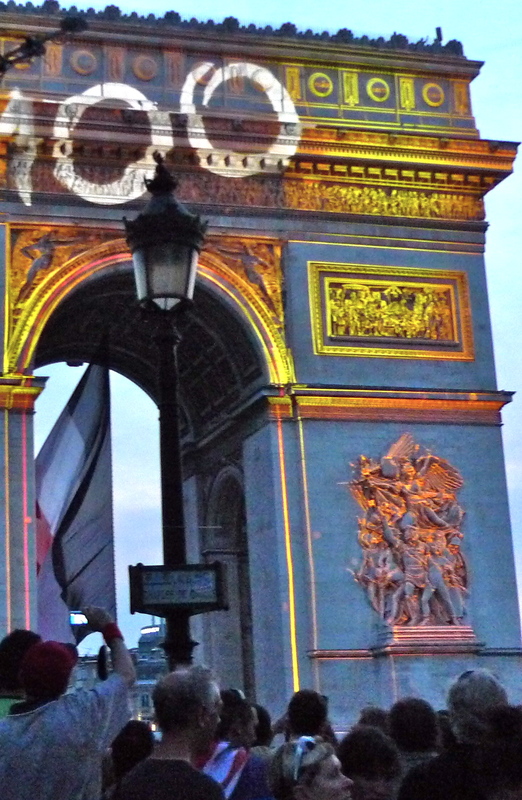 Neither had I expected the spectacular light show that bathed the Arc de Triomphe during the Ceremonie Protocolaire at the end of the race. It was simply breathtaking and I was well positioned to see both. 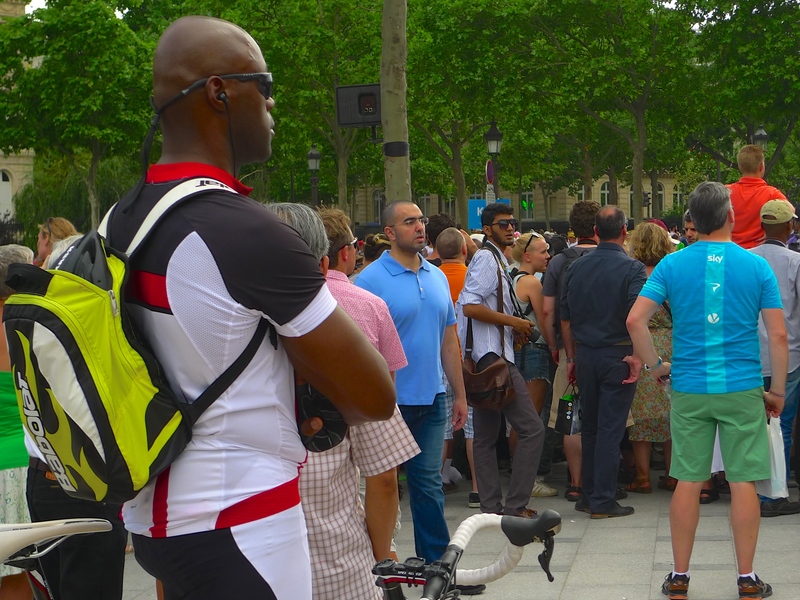 Whether you are interested in cycling or not, or whether you speak French or not, I hope that these sounds will enable you to share in the atmosphere, the excitement and the emotion of the end of the 100th edition of Le Tour de France. Chris Froome has had a spectacular season this year. Having finished in second place in the 2012 tour he won the Tour of Oman, the Critérium International, the Tour de Romandie and the Critérium du Dauphiné this year and now the 100th edition of the Tour de France. A brilliant performance from him and from Team Sky. One to remember.